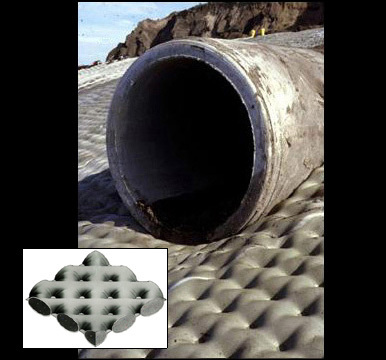 Filter Point (FP) Lining with filtering points (drains) provides erosion resistant, permeable concrete linings for ditches, channels, canals, streams, rivers, ponds, lakes, reservoirs, marinas, and protected port and harbor areas. Filter Point linings have a cobbled surface and a relatively high coefficient of hydraulic friction in order to achieve lower flow velocities and to reduce wave run-up. The filter points provide for the relief of hydrostatic uplift pressures, increasing the system's stability. Filter Point linings were the first type of fabric form for concrete developed. In 1965, a Dutch patent was issued for "fabric-formed slope paving." The form suggested by this patent was later refined to create the first "filter point" lining. As the use of this technology has spread worldwide, a variety of other forms have been developed to meet specific job requirements. However, Filter Point remains the most widely-used form style.